A smaller alternative to our 18 watt grow light, this E27 spotlight is also passively cooled through its aluminium housing and therefore completely silent when in use. Despite its small size this light still packs a good punch and thanks to our full spectrum, can be used with any type of smaller indoor plant. We use our own custom spectrum which has been developed with both plants and people in mind. By only selecting wavelengths where different plant pigments peak in production, we can assure very good performance per watt even for our smaller lights. By combining the wavelengths in a well balanced ratio this lamp produces a white light that not only affects different plant pigments besides Chlorophyll but is also more suitable to be used indoors compared to regular LED grow lights where only red and blue light is used. This grow light works well for both small indoor grows and house plants. Besides using different blue and red wavelengths this light also has green light. We use green light for two reasons. Mainly it has a positive effect on cell development in leafs and stems, but also fills in the gap between red and blue light that make up the full spectrum so that all colors are reflected in the grown plants. Have a look under information in the menu to see an illustration of full spectrum vs red/blue spectrum lights. With the help of these spotlights the potted plants stay alive over winter, and even prosper! My house has the living-room to the WNW, and windows shaded by a dark forest. So zero chance for any plants except perhaps moss to stay green over winter. I have tried the usual 'flora-glo' lightbulbs; no results. I have tried the LED 'satellites' which drown the entire house in a purple light; the plants may like it but it is not kind to human senses. The GEMMA lights on the other hand, is a perfect balance of different colors. My living-room is close to exclusively lighted by these GEMMAs. 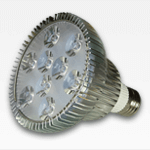 I have 2pcs 12W, 4pcs 9W, 2pcs 7W and 4pcs 5W. Sure they are a rather valuable set, but this is about the comfort of me and my family and thus worth every cent of it. Bonus: Even the chillies grow pods in in the winter.